Much of what I listen to on the regular is of the three-chord punk variety. While I want the bands in that field to switch up their sound, to develop and grow, the differences are usually pretty subtle in that world. The Coathangers, though, are something else and for some reason I’m always surprised when I put on each new record and hear the evolution first hand. Each of their records has had its own vibe, but it never feels like a brand new band. 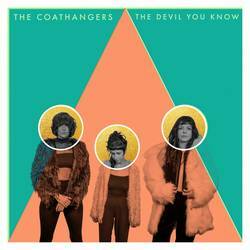 It’s been a slow growth from No Wave-influenced noise-pop to The Devil You Know which is bouncy in that weird Coathangers way that’s seriously peppy while simultaneously full of punk angst and unexpected turns. This release reminds me of mid-‘90s alt rock more than previous records, using dynamic shifts and in-song vocal tradeoffs for a layered feel. Instead of each of the three members penning their own whole songs, the trio pulled together here for a seamless blend of the different internal voices. First, with a name like The Coathangers, you shouldn’t come into this expecting subtlety. Songs like “Hey Buddy” and “F the NRA” don’t leave much to the imagination. While it’s politically blunt, the songs always have the rhythmic hook that makes it feel both like a call-to-action and something you can groove too. Many bands forget that it doesn’t have to be one or the other. “Bimbo” leads things off with a pop beat and melodic vibe that alternates between vocalists and, consequently, tones. It’s both a lament and a forceful call to take charge of a breakup and move on. “Last Call” is a standout on the record, even if it’s got some serious ‘90s vibes that could easily be overdone. The golden chorus has me thinking of L7 but the rest of the song is arranged more like The Pixies with a calm-to-crest crescendo cycle. That those two influences can come together is a testament to how The Coathangers can craft a song. I could easily see it used in film. “Lithium” is a dreamy ethereal number to closer things out. So where does this record stand? It’s consistent all the way through and it meets every expectation. I won’t say it’s a gamechanger for the band, but it’s damn good. There’s clever alt-pop, rage, balladry and pretty much everything in between. Posted April 8, 2019, 10:12 p.m.
Posted March 2, 2019, 10:30 a.m.
Posted May 5, 2017, 8:08 a.m.
Posted Oct. 6, 2015, 3:10 p.m.